THE HEALTHY SNICKERS PIE RECIPE IS HERE! 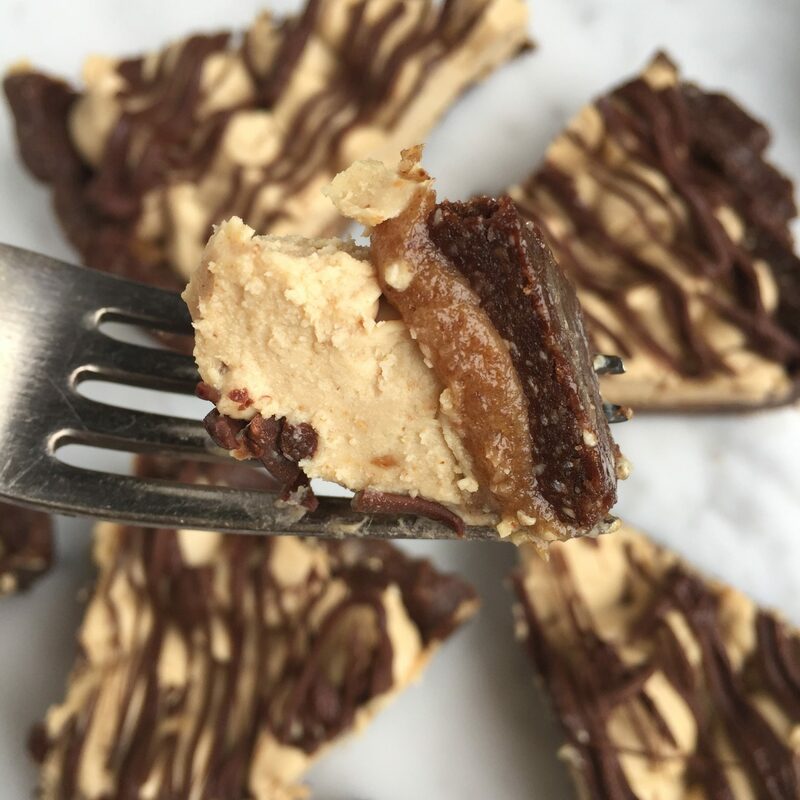 I repeat – the gluten free, refined sugar free, paleo, vegan, raw, ooey gooey chocolatey caramely peanut butter-y healthy snickers pie recipe is here. This pie is such a star. 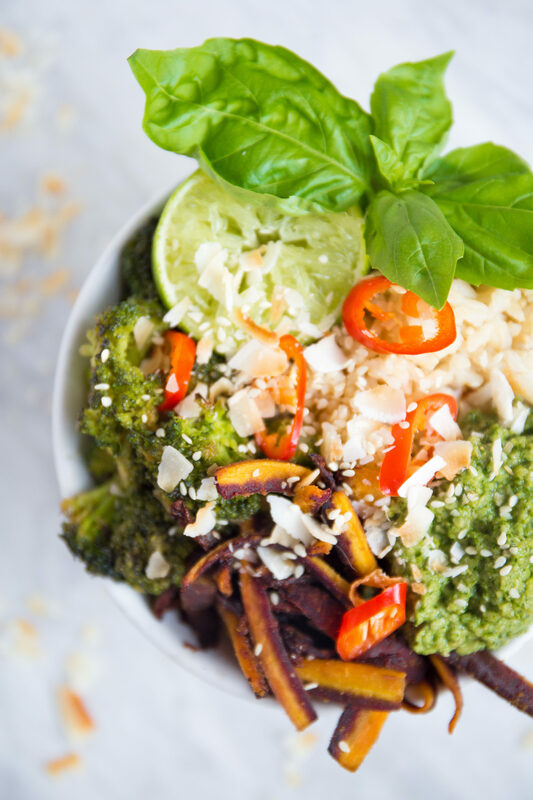 It’s super easy to make (I do it all in one food processor, without washing between) and it will wow health-conscious and non-health conscious guests alike. It’s packed with fiber and good fats from the coconut and nuts and will fill you up, rather than spiking your blood sugar and leaving you feeling icky. Confession: I sometimes eat this baby for a decadent breakfast. Now ONTO THE HEALTHY SNICKERS PIE RECIPE. Open the coconut milk cans and scoop out solid white coconut cream (save the remaining coconut water for a smoothie). Add to food processor with remaining MOUSSE ingredients, then process until smooth. Spread evenly atop of caramel layer, then return to freezer. If desired, top with an additional drizzle of dark chocolate, melted in a double boiler or microwave. Freeze overnight, and store in freezer but let de-thaw on counter for about 10 min before serving your very own healthy snickers pie. Hello! I’ve just made this as a birthday cake for my husband and it’s a massive success. Thank you for sharing this recipe. Would this recipe still work if I used almond butter instead of peanut butter? Thanks. I made these last night and just tried one….AMAZING! It tastes like those Snickers ice cream bars! 🙂 I ended up using coconut cream rather than coconut milk, since for some reason, the can’s contents did not separate into the solid and liquid part. OMGosh! Made this last night for a girl’s weekend at the cabin and I am super excited to get there and dig in! I had a little taste test and it’s amazing! My friends and I usually eat and drink all the bad things when we get together but lately we have been trying to make healthier choices, and this right here allows us to have the best of both worlds…delicious and nutritious! Thank you for sharing! I tried this recipe for Father’s Day and everyone was so impressed! I added a chocolate mouse in the middle, however, to give it a little more chocoholic appeal. Thanks for the amazing recipe! Oh my goodness, I made this tonight and it is delicious!! We didn’t wait overnight for it to freeze, we just couldn’t. Wow, I followed the recipe exactly and my entire family loves it! Amazing! I made this, subbing sunbutter due to an almond allergy, and my whole family loved it. They aren’t vegan or health-conscious, and are VERY into dessert, but this was a big success with them! Thanks for the great recipe! Made this for Easter. My son in law was very skeptical to say the least. He had three pieces. Entire family loved it. Thank you so much for the recipe. This was so amazing!! Better than I dreamed it would be! My whole family loved it, even my husband who doesn’t like anything the least bit healthy!! 🙂 Winning! Reply to Best Ever Paleo Desserts Recipes with Over 50,000 Pins! Vegan, not vegan, vegetarian, herbivore, carnivore, omnivore, whatever…. you must try this pie! It is SO delicious. Great recipe, I have made it several times and have shared the recipe several times. Great stuff. Hey the recipe sounds great! If ghee is used, the recipe isn’t vegan so stick to coconut oil instead. Thank you for making so many vegan recipes! I made this using mini cupcake tins and plastic wrap instead of parchment for a potluck at my church. This pie was a HIT! Barely had any leftovers and two people asked for the recipe. I’ll be sure to send them your way. I’m in love with this recipe. Do you use raw or roasted nuts for the crust? Absolutely delicious!! Can’t believe how much it actually tastes like I remember snickers tasting ?? This was amazing!!! I served this at a brunch and received rave reviews. Thank you for sharing something that ALL will enjoy. This will be the Summer of 2017 dessert! : ) It may end up being THE DESSERT. Thank you!! Love it! I made it for a party and it was gone in just a couple minutes!!! I only got half a slice that I shared with my fiance! Making it again for my fiance and I for our anniversary dinner. M m m! Great ingredients list, great photos, and this great pie is off to my must try list! 🙂 Yummy! Hi, thanks for the recipe. Just wondering if this could be made in a slice pan. yes, definitely, just line it with parchment paper! Can you tell me the carb count per serving? I don’t count macro nutrients, sorry! Hi! Can regular dates be used in place of Medjool? Yes, just soak them in boiling water for 20 minutes then drain well before using. Made this for Easter — it was amazing! My new favourite dessert! Wanted the top layer of chocolate, but wanted to keep it (refined) sugar-free, didn’t have sub for the chocolate. Used icing from my favourite date-brownie recipe: 1/4 c. maple syrup, 1/4 c. cocoa powder, 1/2 vanilla, 2 tbsp melted coconut oil. Worked perfectly to spread over the top! I’m sorry – I meant to ask if the nuts for the *crust* have to be unsalted? And I’m assuming salted almond butter or peanut butter for the mousse is fine? Yes exactly, unsalted for crust and salted for mousse is fine! I don’t own a food processor, do you think a blender would work? I don’t, unfortunately – blenders are really meant for liquids! 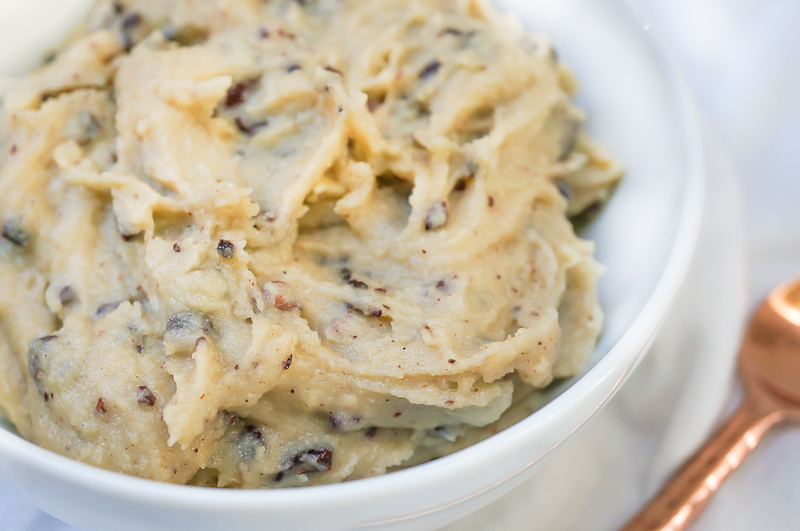 Omg, I just made this….It is insanely delish! I made it for a friend that can’t consume any refined sugars without getting violently ill, and let’s face it, pretty much all store bought desserts have refined sugars. Can I use date paste instead of individual dates? I don’t think that will have the texture you need for the crust to hold together! I made this for Pi day and it was delicious! Tasted like an ice cream pie! Can I use a 9″ pie pan? How long should each time be in the feezer? A 9″ pie pan should work, and in the freezer you’re just looking for it to set up, so 20 minutes or so is usually fine. This looks AMAZING. My mom has been eating along the guidelines of Primal/Paleo for years but I’m new to the game and this will be perfect for our girls weekend! I just made this for my husband and I for our anniversary tomorrow! Haven’t had a piece yet, but licked my fingers after each step of the recipe and was very impressed! I have been gluten free for several years, currently struggle with gut issues and recently working on going grain free, dairy free and sugar free. I will be browsing your site for more winning recipes! Wonderful, thanks Sheri! And happy anniversary to you and your husband! What a perfect recipe! I needed to add two tablespoons of water to the crust, but other than that, the recipe was dead on! Thanks for a great alternative to my doughnut addiction! Dates soaked in boiling water. Does this mean I boil the water, take it off the heat and then soak the dates, or does this mean I boil the water, put the dates in, and leave the water boiling? Boil the water, remove it from heat, pour it over the dates, and let the dates sit in a bowl, covered in the water! Hi there, just had a quick question, I was reading through the recipe and the comments and I wasn’t sure if I should used can coconut milk or can coconut cream? You can use coconut cream, but the recipe as written has you buy coconut milk and scoop out the coconut cream, since for a lot of people it’s hard to find coconut cream on its own. Amazing!! My hubby loves it too!! Absolutely amazing! My mother tried it and hates dates, she was surprised at how great it tasted!! Does the Coconut oil need to be melted before being mixed in? Or does it get mixed as a solid? Would this work with raw Cacao powder instead of cocoa or would it just ruin it? No, raw cacao would work great! My husband found this on Pinterest, and begged me to make it for him. I was skeptical as I looked at the ingredient list, but thrilled with the outcome! (And I do so love making anything in my food processor… somehow I just feel like I’m cheating, it’s so easy!) This dish is very similar to a treat I used to make him every year for his birthday called Frozen Marbelous Peanut Butter dessert. It had a peanut butter cookie base, a peanut butter, cream cheese, cool whip “mousse” and chocolate swirled through the top. I never thought we’d have it again when we went grain/dairy free, but this was so close, and so delicious! Thank you for the recipe, my husband was so excited! My crust doesn’t stick together at all. Is that normal? Hey Chris – try letting it go around in the food processor a bit more, often that’s needed to break down the nuts. If that doesn’t work, try adding one more Medjool date. Let me know if that helps! Pssst…. not to be “that person” but de- thaw basically means freeze. I think you just mean let it thaw… otherwise looks amazing and I can’t wait to try it! Hi, how long can this be left out on the counter for? I’d say about 30 min – 1 hour, depending on how warm your house is! Tried making this in a blender and it wasn’t too bad. I just made sure all ingredients were incorporated before layering. I also substituted cream cheese for coconut cream since that’s what I had on hand. Everything tasted great separately, in the freezer now to try tomorrow. I didn’t have parchment paper so I made this in individual servings using silicone muffin cups. I did have trouble getting the right amount of each layer in the cups but other than that it was super easy and delicious! I just bought all my ingredients to make for Thanksliving, but the coconut milk cans are all watery. Will the consistency change after refrigeration or should I buy some coconut cream? Thanks! Hi Megan! Sorry – I just saw this! But refrigerating coconut milk overnight will produce the cream. Hope that helps! So excited to try this recipe! Quick question- would agave nectar work instead of maple syrup? I assumed honey would change the texture too much, but the agave is pretty close to maple syrup as far as thickness goes. Any thoughts? Hi Jessica! It makes one pie, which serves 8 – 12, depending on how you slice it. It’s quite a rich pie, so I think smaller slices work great! Would it be ok to make in muffin tray (with paper liners)? I would like to be able to divide it for two occasions that both require transporting it so don’t want to defrost and freeze again multiple times. Yup, that would work really well! 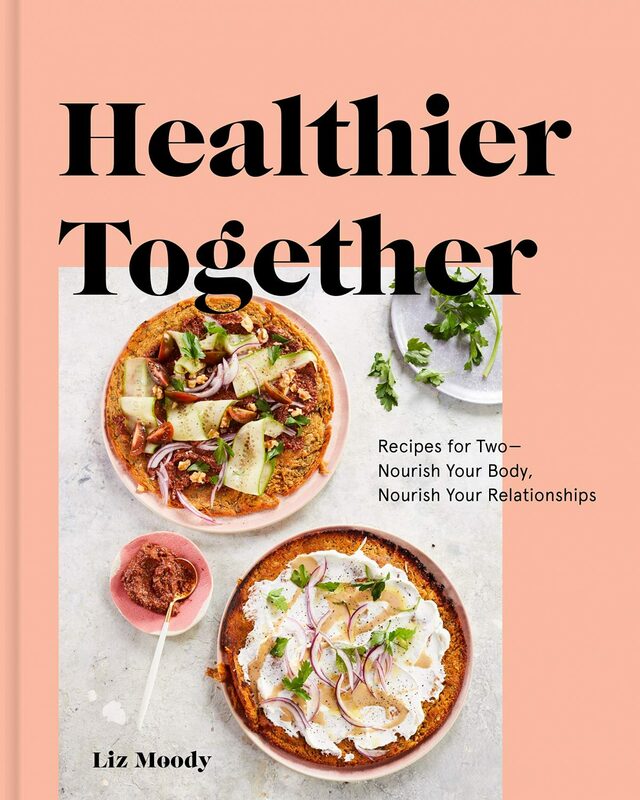 I’m really looking forward to whipping this up but don’t have a food processor – do you think the ingredients will come together in my blender? Thanks! I think so – just use a really slow setting and scrape down the sides a lot! I made this recipe for school the other day and several people have asked me for it. I sent them an email linking to your page. Just a note that I used one can of coconut cream, instead of two of coconut milk. I know some people have trouble just finding the cream, but if you can find it, one can worked great. Hi Sarah! There are lots of gluten free, raw and vegan recipes, although it’s not 100% that. You can definitely find a TON of recipes you’ll love though, I’m sure – I recommend starting with “The Popular Kids” in the sidebar. I really want to make this… but I am not a huge fan of dates or that “fruity” taste that sometimes accompanies things that have them. Does this have that? Or do you not really taste them? Hi Sophie! It would “work” but it would be not super solid. For the fridge, maybe try the recipe but with small tarts (made in cupcake tins with a liner) and treat the peanut butter mousse more like whipped cream you dollop on top? This was an amazingly delicious cake. It was made entirely by my 10 year old who has no cooking experience. Absolutely delicious. Not cheap but worth every penny. Thank you! This is a flawless recipe. First time making a grain-free cake like this & it came out perfect. Will definitely make again! Yay! Thanks Alex – I’m so glad you liked it! Have you ever used almond butter or sunflower better in place of peanut butter for those who are allergic to peanuts? Absolutely – I love this with almond butter! I used sunflower butter when I made it, and I loved it. Thanks for sharing this recipe! I am always trying to get my extended family to eat healthier desserts without all that refined sugar and it is not always very easy to convince them, but this recipe was a HUGE hit at our Mother’s Day get together! Yay! Thanks a million! My pleasure! I’m so glad it went over well!! Any nut butter will work brilliantly! Thank you for this recipe! I haven’t tried it yet because it’s freezing but it smells wonderful and each layer, individually, was delicious! 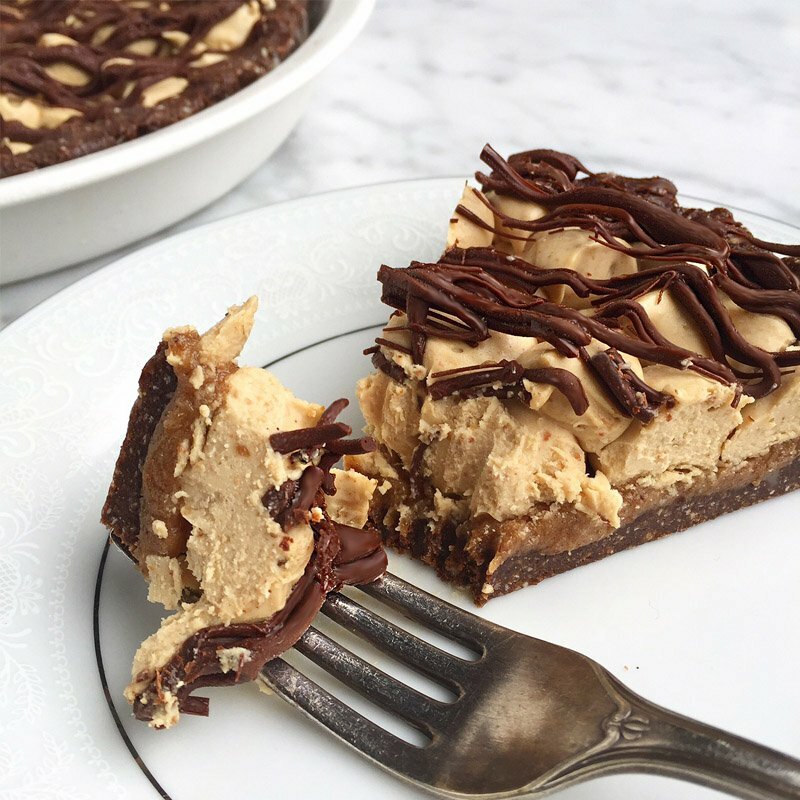 I made your recipe for Healthy Snickers Pie and it was delicious! Also the p’nut butter ingredient is not specified. Is there a recommended kind to use? will a 4-cup size work for the food processor?? i’m so nervous! i had this the other day, and it is AWESOME, and i want to make it on my own, but i bought a tiny processor, aha! hmm…I’m not sure. Often the smaller food processors don’t have the mixing power you need for the crust. Try it and let me know! This sounds awesome! My husband has a tree nut allergy. Should peanuts and peanut butter work for the cup of nuts and in place of the almond butter? This would be awesome with almond butter! I also have a tree nut allergy so this is my question as well. Snickers contains peanurs so I’m thinking it’ll work. Did you try it? Don’t have a food processor. Can this recipe still be made? Hi Brenda – I don’t think so – you really need it to make the crust! You could potentially make it if you bought a crust, but it’s hard to find healthy ones! Looks delicious! Can I use a spring form pan?thx! Yup, just be sure to use parchment paper as well, otherwise it will stick! Can you substitute Medjool dates with raisins? I’m on a low fod map diet and can’t eat dates but would love to make a nice treat!? I’m not positive, but I think that would work really well. Try it and let me know! If I don’t need to make this vegan and wanted to use butter instead of coconut cream how much butter should I use lsince there isn’t an actualeasurement for the coconut cream)…thanks! The coconut cream has a better texture for this than butter – the butter is a bit denser and I think would give you a worse texture! I’m not sure, unfortunately – I haven’t tried it with anything else. Maybe look around the internet for some good crust recipes, and then build the rest of the pie off of that? What size can of coconut milk is needed? I’m not a fan of coconut. Can it be replaced with something else? Can’t wait to try it!! Hi Tracy – it’s hard to replace coconut in this recipe, since the coconut cream makes up the bulk of the peanut butter mousse, and the flakes are integral to crust texture. I might try it anyways, though – the coconut flavor is quite disguised by the other ingredients, it doesn’t really taste like coconut at all! Excellent…I’ll give it a shot this weekend!! Thanks so much! Is it necessary to freeze this or can you just refrigerate? Made this pie for our holiday lunch, and it was a huge success. Making it again ASAP! Thank you for sharing this with us. Made this last week and it was amazing! Thanks for the recipe! It is only 3 tsp of oil. How important is this? Heart patient so I don’t cook with oil. However I do have some oils, but not coconut. And never head of ghee. Can I subst with say marg? An 8″ round pie pan! 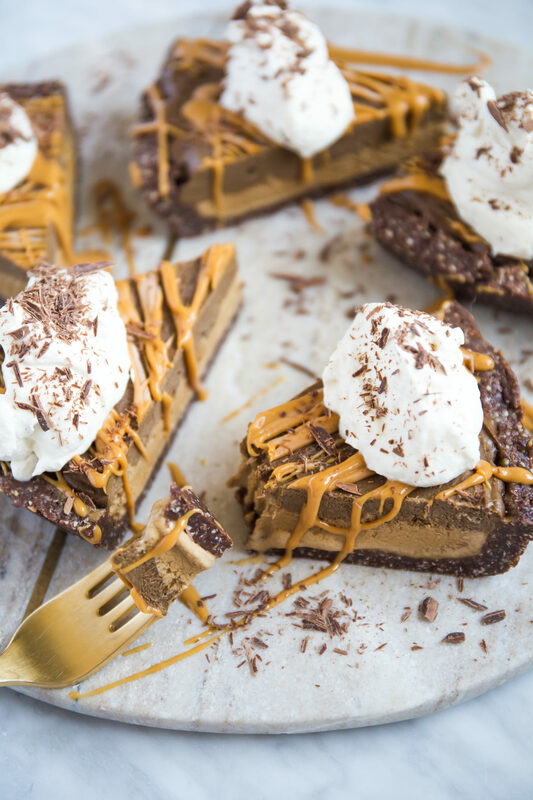 I repeat – the gluten free, refined sugar free, paleo, vegan, raw, ooey gooey chocolatey caramely peanut butter-y Snickers Pie recipe is here. This pie is such a star – it’s super easy to make and it will wow health-conscious and non-health conscious guests alike. I am blind…I see it now.? What did you drizzle on top? Doesn’t look like recipe includes that. Can I use ground up nuts like almond flour in place of whole nuts, if so how much?